Meet Anesthesia, the dream dealer’s daughter! This stunning new art collectible 12” vinyl bust was designed and sculpted by Doktor A, which really spotlights Dok A’s beautiful style and detailing. This limited edition bust will be available in two colorways exclusively at Designer Con 2017 this weekend in Pasadena. 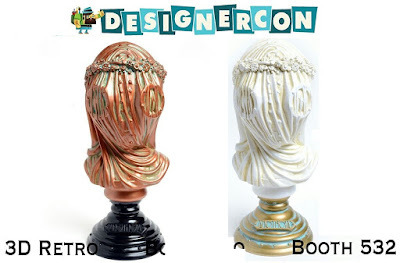 The Bronze “Usher” Edition and the White Edition will both be available at the 3DRetro DCon booth for $100 each. The White Edition is limited to just 50 pieces. After you purchase your Anethesia Bust be sure to take it over to Doktor A’s DCon booth #114 to be signed by this amazing artist.